A decade ago, Hamza Perez, born Jason, was a drug dealer on America's mean streets. The child of Puerto Rican parents, he had two recurring competing dreams at night: in one he was in prison by age 21, and in the other he was dead. New Muslim Cool is the story of how, as Hamza laughingly puts it, "both [dreams] came true," albeit in unpredictable ways. Indeed, when Hamza was 21, he was hanging out with friends and getting high when a chance encounter with an "old sheikh" transformed his life. The death he experienced was "a death of all my past, the negative," he says. He gave up drugs and the street life and converted to Islam. 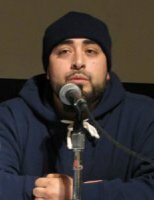 He then went further, becoming active in forming a community of Latino and African-American Muslims, many of whom, like Hamza, were former street hustlers and drug dealers. The community ultimately moved from Massachusetts to Pittsburgh, Pa., with Hamza bringing along his son and, after the breakup of his first marriage, his daughter. He is the focus of the Documentary "New Muslim Cool". A resident of Pittsburgh, Hamza reaches out to prisoners, using his faith and struggles to inspire them. His work also leads him into surprising alliances with ministries of other religions that, like his own, seek to build a road to redemption from the nation's jails.